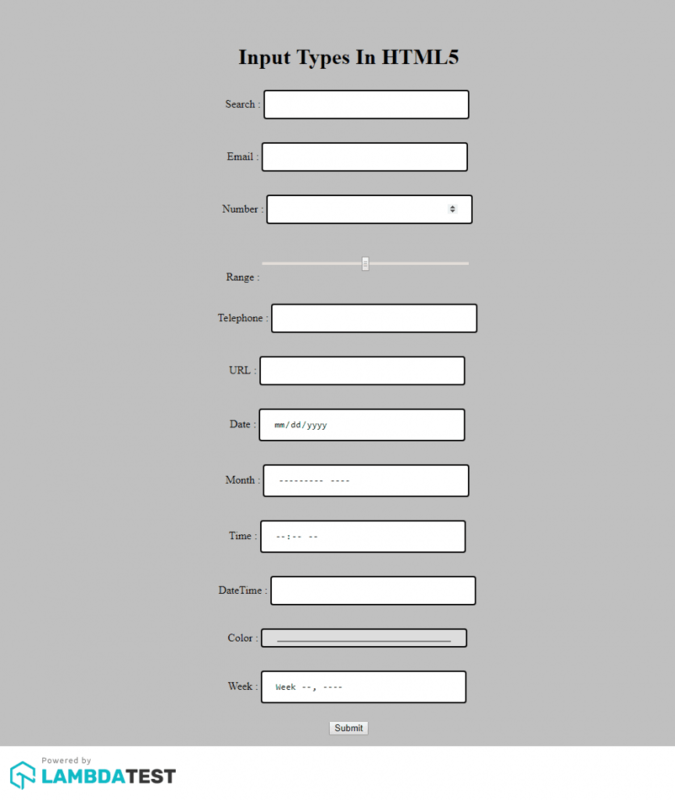 Home » HTML5 » Are Your HTML5 Input Fields Cross Browser Compatible? Forms are integral part of your online business. Being the primary source of data collection for your visitors, their appearance on the internet matters more than you can think of! Keep in mind though, that even if you do design them neat and catchy, they may end up looking absurd when accessed through different browsers and browser versions. In this article, I will demonstrate cross browser compatibility of the new input form fields that were introduced with the introduction of HTML5. I will design a simple HTML form with all input fields, and will perform cross browser testing for that form using LambdaTest. 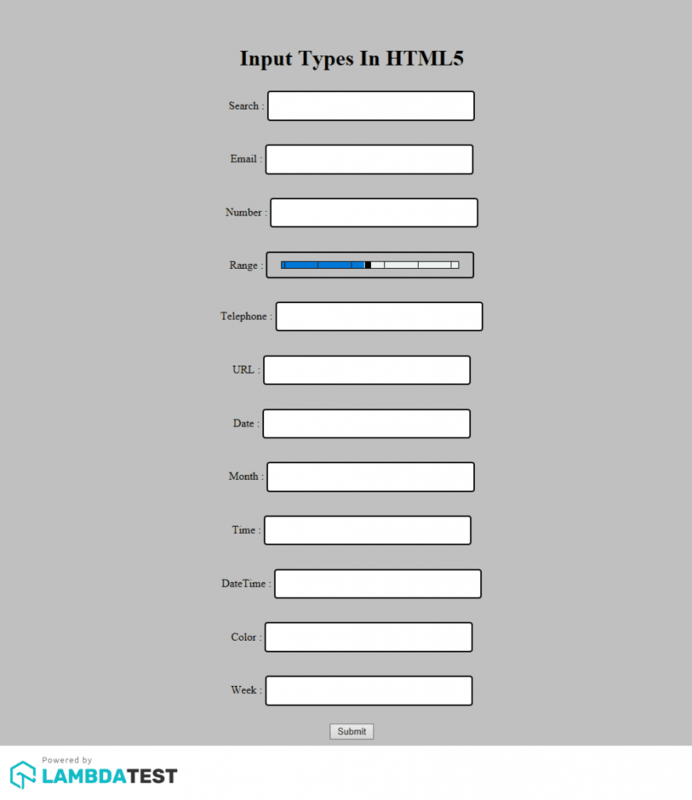 An input field in HTML is used for giving the option to the user to enter the desired input. This input can be anything like your contact number, your residential address, date of birth etc. Since the inputs are variable there arise a need to mention and validate this at the client level only. Let’s say you are filling a driving licence form and you are required to enter the mobile number but mistakenly enter your pin code instead. We can also think about a scenario where your D.O.B is required and you enter it in whatever way you desired. Since every human thinks differently, some would write 08.04.1995 and some would write 08-April-1995. There are literally a lot of ways to enter your date of birth and although all of them are correct and understandable by humans, this is not the case with computers. In computers we need to feed the logic at the back end to save your information correctly in the database. If we get so many different kind of entries for a single column in the database, we need to feed the logic for all of them. This is clearly not feasible. Even if we say it is feasible and we can put up the logic, there is no way we can derive all the ways a billion of humans would enter the date of birth. This is a huge problem and was existing before HTML5. However, with the introduction of HTML5 came new types in the input field to makes the work of user and developer easier than ever. 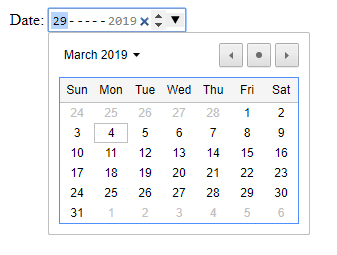 Now, you don’t need to enter the birth date but instead can open the calendar in the input box and then select the date. This will automatically fill the box with the predefined format. Although many types have been introduced in HTML5, all of those are not “so important” as it might seem. In this article, we will explore each of them and see whether they are important while coding your web page or not? So we have divided this article into two main parts namely Relevant Input Types and Irrelevant Input Types. Before we go ahead and deep dive into this article, you can check out the complete HTML5 form sample on one of out LambdaTest Experiments where you can witness the rendering of the same form over different browsers by performing browser compatibility testing. I have made use of automated screenshot testing offered by LambdaTest to quickly capture the appearance of my form over multiple browsers, simultaneously, in a single test session. I will be talking more about everything in details, as you read further. Here we go! In this section, we will explore the input types introduced in HTML5 that are relevant to use and have vanished the difficulties we faced in the previous versions. Before this option, searching was done on a normal text field. Although, it does not affect anything at the back end of the search operation, it does ease it out for the user and provide few stylistic effects. When we have the HTML5 form input field as search defined, and you start typing something then a small x can be seen at the end of the box. This is for clearing out the complete search phrase. There is also an important thing to note in the mobiles when you are entering the email address. In the keypad, you will automatically see an ‘@’ and ‘.com’ for easy entering. You would not be getting this while using the text field. As you must have already guessed with the name, number type is used to input a number in the input box. Although, a text field would do a similar job but number type ensures that the user has entered the number only instead of anything else. Moreover, for number type you also get to decide the min and max value of the input number as shown in the code below. Since step is equal to 4, the legal values becomes 4, 8, 12, 16…..40. Talking about the effect of number type in the input field, the browser adds its own useful properties for the easiness of the user. The desktop browsers Chrome, Safari and IE adds up and down arrow to increase and decrease the number. In the mobile browsers, your keypad automatically changes to numeric one once you tap on the input field. That is quite convenient too. However, if you plan to deliver a seamless experience of the customization over this field then be sure to perform thorough cross browser testing. Did you notice the difference in cross browser compatibility? Now that you do, it would be a good practice to include this in your testing checklist so you don’t miss out on cross browser testing for verification of your web design if you are using Range as one of the HTML5 input fields. You could also opt to go for the step attribute in this case. It is accepted and implemented by every browser except IE version 9 and before. You must be wondering about what is the use of telephone then anyway? Why didn’t they just use number field. Well, for starters telephone cannot have those up-down arrows to increase and decrease because you have a fixed telephone number. Also, whenever you tap on this input type you will be prompted to auto fill (if you have enabled that feature in your browser) and that way you can save time. You will also dynamically get the numeric keypad when you click on the input box to enter the number with ease. It is seen similar to the telephone or text field as a plain input box. The input type URL also helps in the mobile effects when you are using the browser on mobile. Normally, companies like apple try to provide convenience to their users by creating effects. This may include browser effects and automatic keyboard change to the one which contains ‘.com’ or something else. URL field is a great introduction to the web designing world. Date type has introduced the calendar also to select the date with the ease of convenience. Now when you tap on the date box, a calendar pops up in which you can select the desired date and it will be automatically filled in the input box. This is shown as below. This has helped not only in filling the birth dates but selecting dates for other purposes like flights, trains etc. Using min and max attributes, you could enumerate minimum and maximum valid date respectively. Look at how Google Chrome shows the date input type as opposed to the Internet Explorer. This will remove the headache of validating the date through JS code. Such feature is very important when you have to apply and eligibility criteria is already set for age. A custom date picker can also be used to enhance the visual appearance of your form but you have to be vary of the browser differences. We have written a detailed blog on fixing cross browser compatibility issue with HTML5 input types where we have corrected the date function with jquery library. You can perform cross browser testing on LambdaTest to realize how well is ‘date’ as an HTML5 input field in your website is rendering across 2000+ browsers and browser versions. This is particularly useful when the desired input is just the month and the year as in debit card expiry details. All the browsers implement it differently but all of them surely do. This although is not an important and essential input type to be used. This is something that can easily be missed as to input date and expiry, a simple scroll panel or text box is also enough. Since the input value is too low (unlike a number and telephone input type) text input type is also reliable in such cases. You can also use other attributes along with this input type such as min (least time to accept), max(last time to accept), read-only (only readable time) and step. You cannot implement size attribute with the time input type because it is not needed. I mean, why would you need to change the size of time input? Even if you want to, you have to rely on CSS for this and code your way through it. Wondering, what’s the difference in cross browser compatibility? Well, if you notice more carefully, you will find that in Chrome 72 has rounded corners. By irrelevant input types, I refer to those input types that were introduced with HTML5 but are either not fully utilised by the browsers or are not needed. Although you can use all of the below data types as you want but this may prove to be harmful for the user base of your website. This input type looks like this in the browser. Now, that we have seen the input types individually and learnt in good detail about them, it will not hurt to combine all these data types and construct a single form, an application form, and see how this form will be seen by the major browsers by performing cross browser testing on LambdaTest. LambdaTest is a scalable, cloud-based, cross browser testing tool that helps you to ensure that your website renders seamlessly over various browsers. LambdaTest offers a browser library of more than 2000 real browsers and browser version running on numerous operating systems, varying from windows to mac in desktop and iOS to android for mobile devices. I have used the feature for automated screenshot testing offered by LambdaTest to capture screenshots in bulk over different browser + OS configurations. If you are an existing user of LambdaTest then here are 10 Must Try Features Of Automated Screenshot Testing On LambdaTest. Now, let’s have a look at our the result of browser compatibility testing performed for our HTML5 form to evaluate the difference in rendering across various input types. 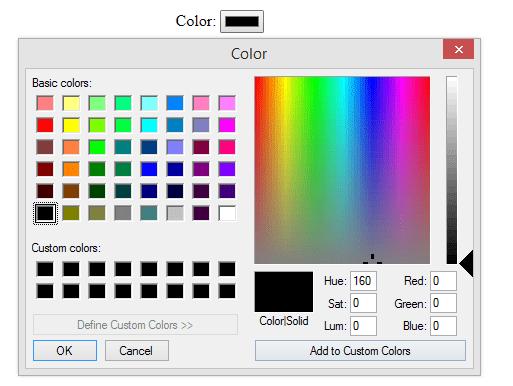 HTML5 brought 13 new input types with it to solve some of the issues that were long faced by the developers. With these input types small but meaningful problems like entering a date or email in the input box was solved. With this the browser developers added their own feature which could catch this input type and provide few extra things to please the user and make things easier. As I mentioned in article all the 13 input types were not relevant and some of them are still yet to prove their existence like color while some are really not needed like week. But as everything is developed keeping the future in mind, we can never say. Maybe today, it is not needed but let’s wait for some time in the future, maybe we end up utilizing them more often than we imagined. A key thing to remember about these fields is the browser differences that are caused while rendering the input form across different browsers. It is crucial to perform a round of cross browser testing to deliver a pixel-perfect user experience to your customers. If you are already suffering with cross browser compatibility issues in HTML5 input types then here is an article which will help you rectify them for field input types such as date/time, color, range, and number. Cheers! Published on Web Code Geeks with permission by Harish Rajora, partner at our WCG program. 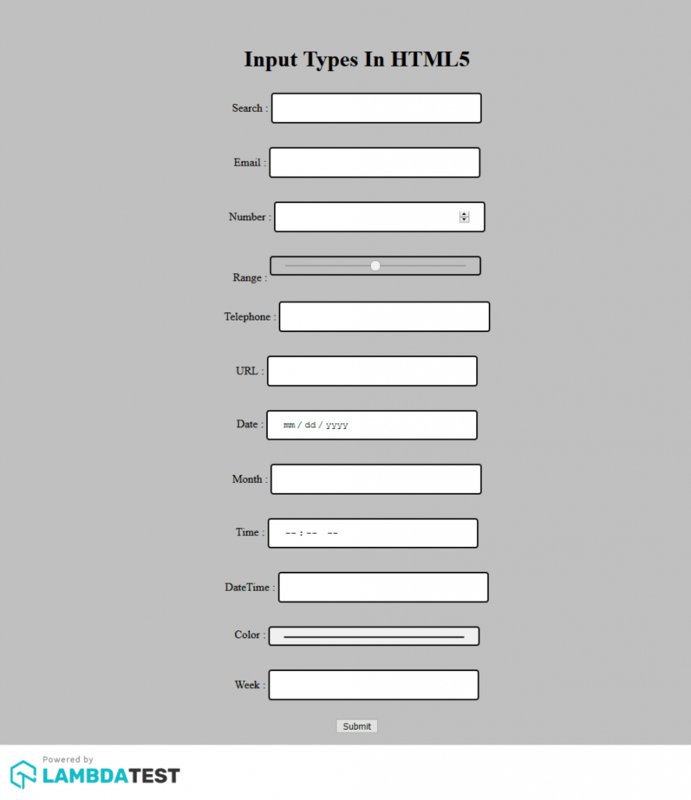 See the original article here: Are Your HTML5 Input Fields Cross Browser Compatible?